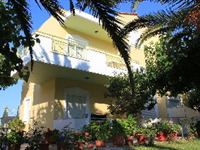 This charming aparthotel enjoys a great location in Georgioupolis. Guests will find themselves in close proximity to the stunning, pristine beach of Stalis, and within easy reach of the many attractions that the area has to offer. Guests can enjoy an array of activities in the area. This delightful complex embraces traditional Greek style, beautifully blending it with modern elements. The apartments are beautifully appointed, offering a relaxing setting in which to escape the rest of the world. Guests are invited to take advantage of the exemplary facilities that the complex has to offer. Room facilities (Standard room): Shower, Double bed, Kitchenette, Tea and coffee making facilities , Terrace, Fridge, Balcony, Direct dial telephone, TV, Bathroom, Safe, Wi-fi, Bathtub, Radio, Satellite TV , Individually adjustable air conditioning.